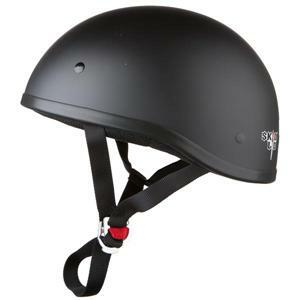 The following is a helmet review of open-face or half helmets, otherwise known as “shortie” or “beanie” helmets. 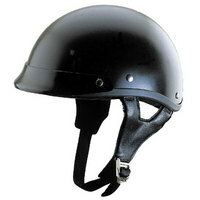 Half helmets are extremely popular with those that ride Harley’s and other cruisers. Helmet reviews are based on personal experience or testimonials from those that have used them. 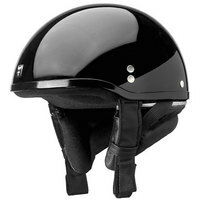 A well known manufacturer of full-face helmets, HJC offers a 3/4 or open face helmet rather than a true half helmet. This is a great helmet for those wishing to have more coverage while still getting that open-air feeling of a half helmet. These helmets are all about comfort! 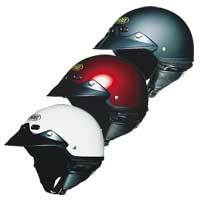 Helmet Features: Lightweight injection-molded thermoplastic alloy shell. Two-piece channeled EPS liner for shock absorbsion. Plush, brushed Nylex interior for a comfortable fit. 3-snap black visor. Channeled forehead vents combine with venturi exhaust vents for adjustable flow through ventilation. Nylon strap-retention band neatly secures chin strap. 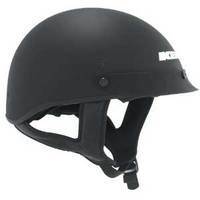 KBC offers several varieties of half helmets and also is one of the manufacturers supplying Harley branded helmets sold by Harley-Davidson dealerships. One of the best made half helmets on the market for the price. KBC Helmets Feature: Lightweight polycarbonate shell. 3 Snap visor. Removable neck curtain. Meets or exceeds DOT standards. One of the best value Harley helmets around. Full featured and very comfortable, yet still affordable. Features: Thermoplastic shell. Bolt-on “shortly visor. Plush brushed nylon comfort interior. Adjustable scalp ventilation. D-ring retention system. High strength stainless steel rivets. High quality paint with clear coat finish. DOT approved. Nolan also makes some great 3/4 and Full Face helmets. 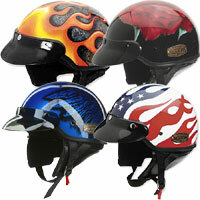 THH offers helmets in shortie, half and 3/4 styles. The popular “beanie” styled shortie helmets are DOT approved and have a new “shortly” bolt-on visor. Chin strap pads provide comfort and prevents strap from flapping in wind. A basic yet comfortable cruiser helmet. Also one of the least expensive helmets available on the market. All products are recommended by the manufacturer(s) or resellers and are not endorsed by this site or site’s owners. This site is not liable for any misuse, defect, or claim arising out of any damages related to the use of any product shown. For warranty or any other claim please contact the manufacturer.